Arranging my classroom library is fun for me. I used to be an architecture major in college (you can read the drama of that story here), so I get a kick out of space-planning and design-y kinds of projects. I've learned a few things that work well for me when I go about arranging my classroom library from scratch. Being in six different classrooms has given me some practice. I'm going to organize my thinking about classroom library arrangement into four areas: Purpose, Placement, Feel, and Extensions, and while there are definitely some overlapping concepts in there, this will at least help me feel like I'm not rambling. So let's dig in! I think it's helpful to identify the purpose for your classroom library. Besides being the location of books (duh), what else do you want it to be? For me, I try to have a balance of (1) space for traffic and (2) space for seating. I actually don't want to have too many spots to sit within the library area itself because I want students to feel like they can come in and have room to look for a book without tripping over anyone. Notice in the picture above that I have one table in the middle that students can sit around. In the past I've had a fold-up lounge chair (which is now in my daughter's bedroom) or an old bean bag chair (which is now in the trash), but not a whole lot else in the immediate area. I also devote a bit of space in my library area to store carpet squares that students can take to other parts of the classroom. (One of my grade level teammates stopped by Home Depot one day and asked for old samples from their carpet department, and now we each have a half-dozen or so.) I have one shelf that I use to keep these stacked when not in use. The amount of space with which you have to work will play a role in your thinking, and a lot of your decision rests in your personal preferences, but take some time to consider the purposes for your classroom library. I know I'm pretty lucky to have a classroom large enough, and a class-size small enough, to have a rather spacious classroom library, without needing to worry too much about fitting all the student desks. Just in the last few years, I've set up three different classrooms, and when I look back, one of my first thoughts about a new room has always been, "Where am I going to put my classroom library?" (Followed by, "What am I going to do with these walls?" but that's another story.) I guess what I'm trying to say is, I build around my library, as opposed to building around the student desks. This mindset has helped me prioritize my space for a healthy library. When I'm trying to decide where to put my classroom library, the number one, most important, biggest difference-maker is... a corner. A corner defines an area. 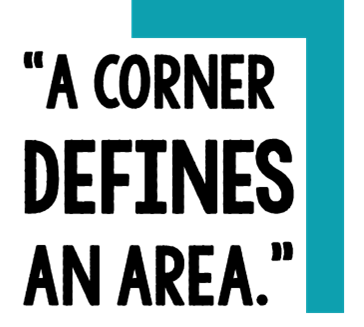 Whether it be one corner of your classroom or a corner you make yourself, that "L" shape creates a space in the angle of the two surfaces that meet, and that's what I'm looking for. Create your own corner with a piece of furniture. A bookcase is the prime choice because it holds books too. Any size bookcase, even a small cheap one, will do the job. Looking at a blank classroom wall. A bookcase set against the wall perpendicularly creates an "L" shape. Defining an area with a corner makes it easier to design a space. Using a teacher desk to create a corner. But a bookcase is not the only "corner-maker." Maybe you can't bring ANY outside furniture into your classroom. Fear not. Shove a teacher desk or a filing cabinet perpendicularly against a wall, and BOOM, you've created a corner. Then where do you put the books, you ask? If you can't use a free-standing bookcase, and you have a lack of built-in shelving, a low cost, efficient, and dare I say, stylish, solution is to use plastic crates for the bulk of your book storage. Filing Crates (or milk crates) become great make-shift bookcases, and normally don't fall in the furniture category. They are pretty cheap during back-to-school season and come in lots of bright colors. Let's take this scenario further! Line the front of your teacher desk with two rows of crates, tying them together with zip-ties or string. Stand a few together on their ends to hold taller picture books. Take it even further by wrapping a wood board with foam and fabric and laying it across the top, and you have some seating too. You could really build your entire classroom library out of crates! With my library, I use two corners to create a "U" shape, made from a corner of my room and a low bookcase with a couch behind it. 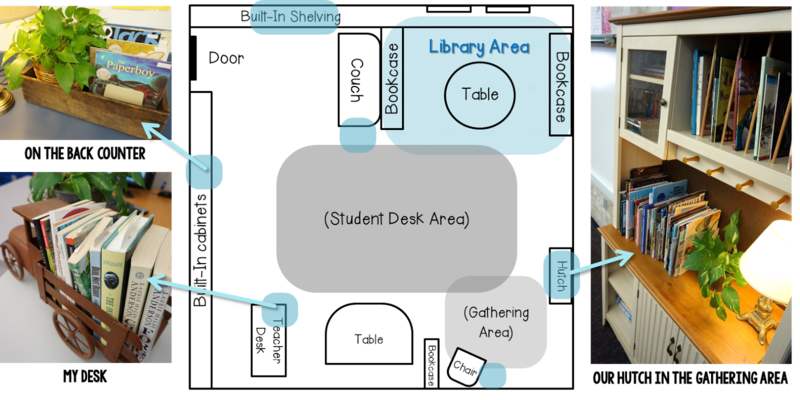 As you place your library and the pieces that define it, also consider where you will likely be during the times when students will be in the library area. I try to keep open sight-lines into my library from my guided reading table, as that is where I am often located. Who doesn't want their classroom library to be inviting? I'm betting that's a word that most teachers would put on their wishlist of adjectives to describe their classroom library. It's definitely on mine. How do you create the right feeling? I've tried lots of ways to make my library a place students want to visit. Defining the area goes a long way in itself, but other accessories can really give it the feel you want. I'm going to give you a lot of ideas now, and feel free to use any and all of them, but as you read through, be choosy. Keep in mind the overall theme and style of your classroom, and see what might coordinate with it. Lighting: A lamp reminds me more of a home than a school, so I love using them in my library area. Many schools don't allow lamps, but I've even used one just for "show," never even plugging it in, just setting it nearby for the look of it. Lantern lights or stringed patio-style lights give a cool feel too! Comfort: Add some comfort to your library through texture and softness. Think about: tablecloths, rugs (bath rugs work great), bean bag chairs, carpet squares, curtains, and... pillows, maybe. Think carefully about how you use pillows. I've gone from having loads of them, to hardly having any now, mainly because of a couple of cases of lice. It just wasn't worth it. Sorry for the downer. Art: I love putting artwork into my classroom library that has a "reading" theme. Putting something in a frame packs more punch than you may think. I'm not suggesting you buy expensive prints. Student artwork is perfect, partly because it's an original, and partly because the frame itself can play a big role in the overall look. Or try putting your printed library procedures in a unique, stand up picture-frame. It looks great! This summer I'm wanting to find a good deal on some of those large, 3-D letters, specifically the letters: R, E, A, and D.
Containers for Books: Later in the blog series, I'm going to go deep into the "practical" types of bins and tubs that we all need LOADS of for the bulk of our book collections, but can I just tell you, I LOVE finding something interesting to hold books. 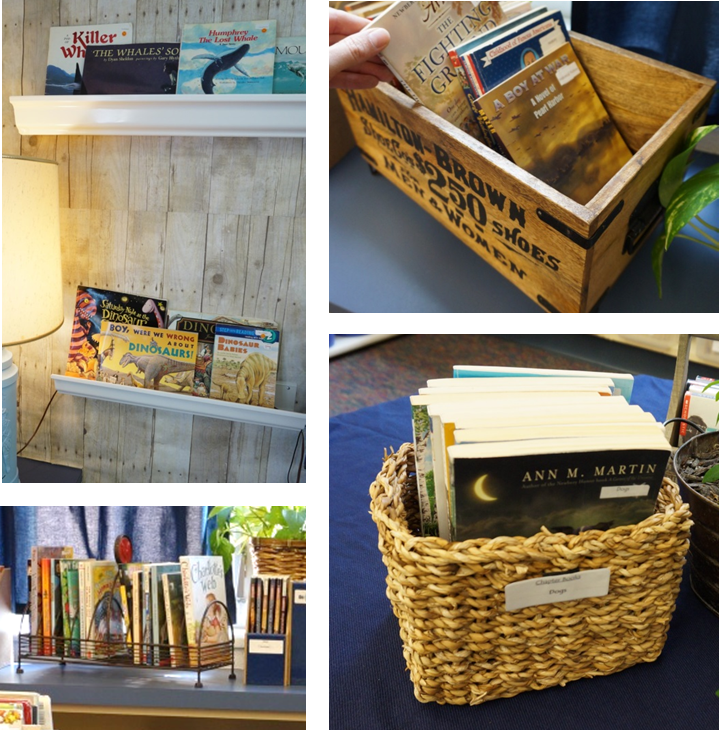 Unique book containers usually aren't advertised as things that hold books, but with a little re-purposing, you can add quite a bit of charm to your classroom library. Before we move to our last section, I want to step back and help you look at more of a "big picture" view of your classroom library's feel. We teachers are always looking for a deal, right? (Did someone say dollar-spot at Target?) And when something comes cheap, we want to buy in bulk. Hey, I get it. But also try to keep an eye out for those one-of-a kind pieces that will add character to your space. Be it a student drawing inside of a cool frame, a table from Goodwill that I spray paint a glossy white, the mug from my summer vacation in Colorado that now holds bookmarks, or the one chicken wire basket I buy at 50% off from Hobby Lobby that will hold a genre of books, it's the little touches that I slowly and selectively add over time that truly give an inviting feel to my library. Let's face it. Right now some of you are thinking, "Great. I love some of these ideas, but I literally just don't have enough space in my classroom library to use many of them." Anyone? Well, if this is you, then I first want you to make that little space you do have into the most charming and most efficient space-using little library anybody ever saw. But then, I want you to think about giving your library some "extensions." (And frankly, I'm not hurting for space at all, and I have several extensions, so really, this is for all of us.) What I mean by an extension is a piece of the library that is placed in a different part of the classroom. Your main classroom library area becomes more of a base of operations, but you infiltrate other sections of your classroom with books. If we go back to my classroom, I have several small vignettes set up around the room that contain books and other reading material. Some might display books about a certain topic, another might showcase a certain genre. These spots have the same feel and style as the main library area, but now I have all these interesting little book "moments" that give me even more space to hold books. In the picture below, all of the blue bubbles show my extensions. Besides adding size to your classroom library (in a round-about sort of way), extending your library into other parts of your classroom has other benefits as well. First, it helps alleviate congestion in the main library area. And second, it has put even more of an overall emphasis on reading. Everywhere you look, there are books. How awesome is that? So many factors go into arranging a classroom library, many that you might not even want to think about. I understand. 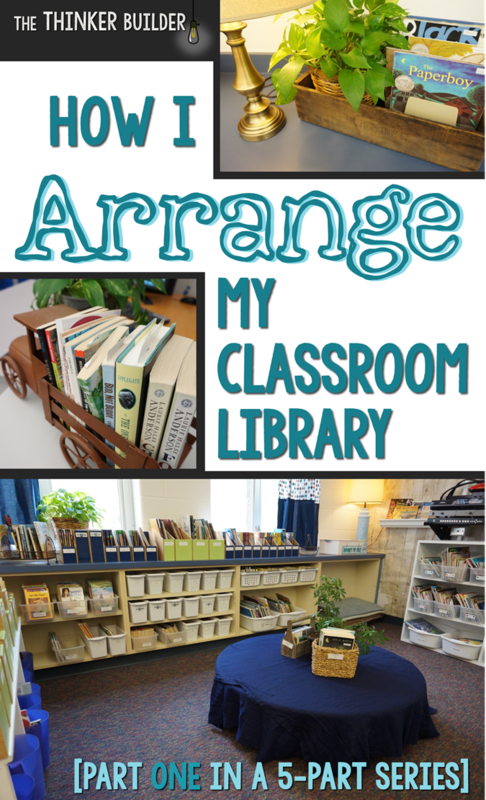 I hope by sharing what I've done over the last few years, you might be able to improve your own classroom library arrangement. Or just as importantly, maybe I've helped affirm reasons you arranged your library the way you already have. Please feel free to add your own arrangement ideas, both the successful and the not so successful, in the comments below. I'd love to hear from you, and I know that other readers will be glad to have the additional perspectives too! Read the Introduction to the Classroom Library Series right HERE. I'm looking forward to Part Two in my Classroom Library Series, where I'll dive into organization, including more about what I use to hold books, as well as how I categorize and label them. I've got some other tricks up my sleeve too, so stay tuned.